Kinetic binding data generated by the easy-to-use AGILE R100 system supports a new pathway for treatment of diseases. The researchers turned to AGILE R100 because of its ability to provide fast, reproducible measurements with a very small amount of sample compared to other label-free methods. Through a joint effort by researchers from the Washington University School of Medicine, Albert Einstein College of Medicine, and Stanford University School of Medicine, a study has been published in Nature that demonstrates a new method for reversing mitochondrial fusion defects to treat neurodegenerative conditions caused by imbalanced mitochondrial dynamics. Healthy mitochondria tether together and fuse to share factors required for proper cell functioning. Without this ability, cells eventually degrade, leading to numerous pathologies including neurodegenerative diseases. AGILE R100, an electronic label-free assay manufactured by life science biotech company Nanomedical Diagnostics, provided sensitive in vitro kinetic binding data that supports the model of positive cooperativity of two therapeutic minipeptides engineered by the researchers. The analysis supports for the first time that mitochondrial fusion activity can be regulated by enabling surface protein conformational transitions otherwise impaired by genetic defect. It delivers a much-needed pharmacological drug therapy pathway for currently untreatable diseases. 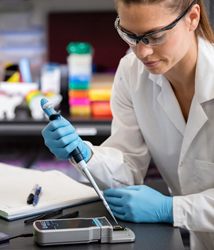 AGILE R100 is a benchtop label-free assay built with proprietary Field Effect Biosensing (FEB) technology that enables detection even with small amounts of starting material, small volumes, low concentrations, and weak biomolecular interactions. The non-optical technique measures current across a field effect biosensor surface immobilized with capture molecules. Binding that occurs on the surface changes the current that is monitored in real-time, enabling accurate affinity, kinetics, and concentration data. AGILE R100 is available for commercial sale, for research use only. For more information, visit http://www.nanomedicaldiagnostics.com. Nanomedical Diagnostics (“Nanomed”) is a biotech company based in San Diego, CA. Nanomed has developed a breakthrough electronic assay based on proprietary Field Effect Biosensing (FEB) technology that provides real-time, label-free kinetic binding and concentration data. AGILE biosensor chips at the heart of the assay leverage the highly sensitive nanomaterial graphene to unite biology with electronics, delivering the unique ability to sense small molecules with no lower size limit in complex media such as DMSO, and use unprecedentedly small amounts of sample.